The perks of the presidency run deep. Your own airline, being the leader of the free world, pardoning a turkey every Thanksgiving. But even the POTUS title comes with some drawbacks. Due to strict ethics laws, any gift worth more than $375 is property of the U.S. government and can only be returned to its recipient if they pay market price. Gifts to federal employees are public record, and a trip through the Federal Register named some interesting presents gifted in the name of diplomacy. Here are 11 of the most lavish gifts the White House has ever seen. Plus some pandas, just for fun. 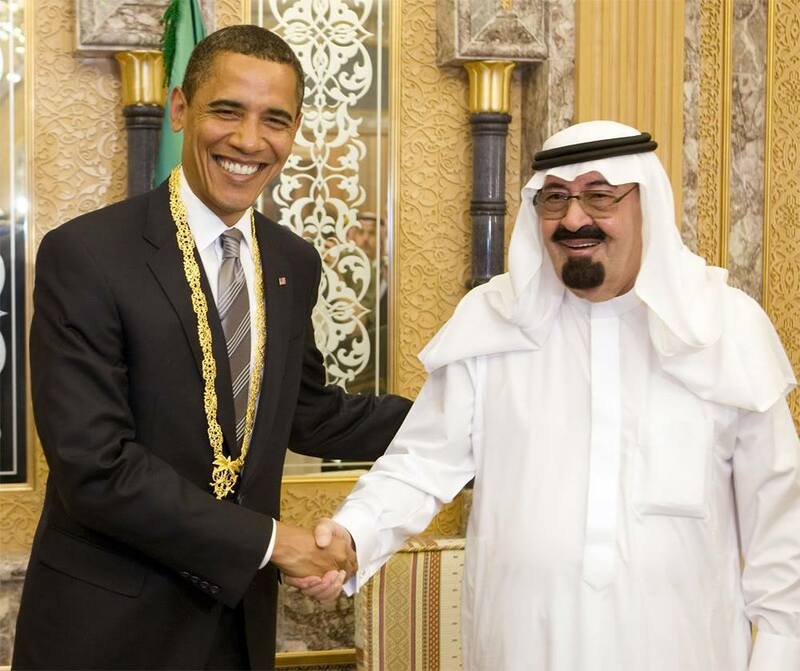 Based on the public record, you might think King Abdullah of Saudi Arabia is Obama’s biggest supporter. In 2008, Abdullah gifted the president with over $300,000 worth of shwag, including rare books, a Jaeger-LeCoultre brass clock, watches, and jewels. That’s quite a haul, Barry O. The HMS Resolute was a British ship built for Arctic exploration in 1850. After it was trapped on an expedition, it was returned to Queen Victoria, who had the timbers fashioned into a desk that she gave to Rutherford B. Hayes in 1880. See? We’re learning. This is fun. It’s been used by many U.S. Presidents since, after Jackie O officially moved it to the Oval Office for JFK in the ‘60s. Where the Vatican is concerned, they mostly stick to art. Pope Benedict XVI clocked in a sizable $8,000 prezzie to Obama with a decorative gold coin (similar to the above) and a mosaic of St. Peter’s Square. Plus some religious texts for good measure, of course. Would you spend $20k on a portrait of the Obamas? You might if you were Chinese President Hu Jintao, and if were embroidered in pure silk. You stay classy, China. First Lady Laura Bush also received her fair share of goodies. According to the Federal Register, she was the proud owner of a $10,000 painting of Bedouins in the desert, presented in a leather case, from none other than King Abdullah, an equal party gift-giver. In the ultimate power move, in 1990, the president of Indonesia decided George H.W. Bush needed an edgier pet than just a dog or cat. Naturally, a Komodo dragon was the next logical step, who was then promptly donated to the Cincinnati Zoo. Above is the HMS Resolute, that ship the desk in the Oval Office is made of, remember? In 2009, Prime Minister of Britain Gordon Brown handed over the original commissioning certificate, along with a golden pen and a first-edition biography of Winston Churchill. The total is estimated around $16K. In return, Obama gave him a box set of classic American movies. Way to set the bar low for the U.S., Mr. President. The single priciest gift on this list goes to Michelle Obama from the Queen of Brunei, who in 2013, gave her a set of jewels including earrings, a necklace, and a ring made from white gold, diamonds, and yellow sapphires, for a whopping $70,000. Diamonds are a health and education reformer’s best friend, right? In 1947, a two-lane bowling alley was built in the West Wing of the White House as a birthday present to Harry Truman from donors in Missouri, his home state. Though he apparently didn’t enjoy bowling much. So...happy birthday? Though there may be no way to calculate their value, arguably the cutest gift on this list was a gesture of goodwill from China to President Nixon after his visit in 1973. The pair of pandas, Ling-Ling and Hsing-Hsing, lived a long life in the National Zoo in Washington, D.C., well-earned after their long journey in the name of diplomacy. Ali Drucker is a staff writer for Supercompressor. All Komodo dragons can be sent to Supercompressor HQ via courier. Follow her on Twitter and Instagram.